Wilkinson Sail’s offers a range of rigging services, including, rigging checks and reports for your piece of mind and insurance purposes. We also offer rig tuning, roll swaging up to 8mm and Taluriting up to 8mm in house, larger sizes by request (including all parts). Wilkinson Sails also stock a wide range of ropes and can provide a splicing service for all types of rope. In addition we can supply guard wire, standing and running rigging replacement, various makes of furling gears supplied and fitted, also service of existing units. We have also fitted spinnaker pole tracks, vertical pole stowage systems, rod kickers, back stay tensioners and gennaker bow sprits. 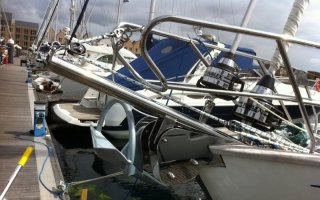 Should there be a need for any mast work required aloft or during layup we can offer many services including fitting of lazy jacks, re- fitting halyards, changing minor stays, cleaning foils and track, fitting halyard diverters, general advise on various problems and retrieval of jammed sails! We have also fitted sheave boxes for extra halyards/spinnaker up hauls, organisers, blocks and clutches also supplied and fitted. If you are in need of something to get your project started, and can’t see it above, just ask!